emotional attitude | Counting my cookies... & Eating them too! There is a time for everything, for everything a season. Today is a day of rest. Much needed, sweet rest. Yesterday I finished the 30 Day Arm’s Challenge which I first told you about here. I am very proud of myself for doing that challenge, and make no mistake about it – it was very challenging! But today I am just tired. I am actually something beyond tired. I am depleted. Depleted of every last ounce of energy. Physical, mental and emotional energy. My tank is on empty. This has been a rough week for me. Have you ever experienced feeling really down, for reasons you can’t quite put your finger on? I’m talking about those stretches of several days where you’re unusually physically fatigued and just want to sleep all the time. Where you find yourself irritable, overly emotional, you can be brought to tears easily and feel angry or upset over little things or over practically nothing. (And no ladies, it actually is NOT ‘that time of month’, although the symptoms are similar). Maybe something in your subconscious that is bothering you. Maybe it’s a combination of small subtle things. Whatever it is, it just sort of overwhelms your mental and emotional attitude and pulls you down. I’ll be honest, I’ve struggled with that many, many times in my life. Depression? Maybe. I’m not sure what to name it, really. But I know one thing, when it comes on it usually hits me strong and it conquers my spirit and can be hard to get out of. In the past, I would let those nameless dark clouds dictate my actions. I would slowly shut myself off more and more from people and life in general and eventually turn to some sort of self-destructive habit to ease the discomfort. I would be defeated. And it would be a major struggle to overcome it and get back to “being me”. But I think I’ve changed a lot over the last 11 months, since I’ve been taking better care of myself, cultivating fitness and good health. Something has changed inside me. Even when I have that feeling of being depleted, I know, I am actually sure of this fact, that I am not defeated. Life is a long and strenuous journey. There are days when our spirits may soar and our outlooks are bright and cheery. But sometimes things happen that just bring us down. And it’s OK.
How you deal with it, accept it, and overcome it, is the difference between being depleted and being defeated. This week I’ve put my body through intense physical exertion with the last few days of the arms challenge. Last week I started a 30 day abs challenge and have been doing that alongside the arms challenge. And keeping pace with my current 4-day-per-week walking schedule. I’ve exerted a lot of energy from my body and asked a lot of it. It gave me everything I asked for, right when I needed it. But our bodies can only take so much sometimes. We need rest. Work has been challenging lately. Missed opportunities, overwhelming challenges, long hours, high stress. These things can all cause emotions to run a bit haywire and impair my ability to keep a clear and positive mental state. Combine that with a body that has given all it has to give, and you end up just plain wore out. Today I am thankful though, that I have learned to recognize when I start to feel mentally and emotionally overwhelmed, that it doesn’t need to scare me or make me think something is wrong with me. I can just recognize it as the signs that my body and spirit have put out a lot of effort and have just run out of steam for a while. I believe a little rest, some good nutrition, a bit of prayer and a sprinkle of hope, will prevail. I’ll be back on top of my game in no time. Defeated is hard to overcome. The difference, primarily, is in the choice you make on how to define what your feeling. Are you really defeated? Or are you just depleted? 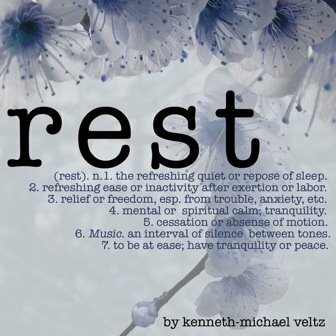 Don’t be afraid to give yourself rest that you need. Speak words of encouragement to yourself if they are not coming from anyone else. And more importantly, believe in yourself.